I have two antiquarian books that may appeal to some of our readers. Part of the Uniform Editions of the Plays of J.M. Barrie. 1st thus of the Scribner’s printing in 1920, copyright 1918 by Barrie. In very good condition with a tiny tear on the upper spine from shelving over the years. No DJ. Dark green boards with gilt lettering on cover, signs there had been the same on spine but spine lettering has faded to mere impressions over the years. Tight spine, clean crisp pages (deckled on edges). Incredible condition for this lovely slim volume from so many years ago. $45.00 plus shipping. Can take PayPal but will need to add in their percentages. Can take credit/debit by phone (802-222-5826 – store open Tues-Sat. 10am-7pm ET). 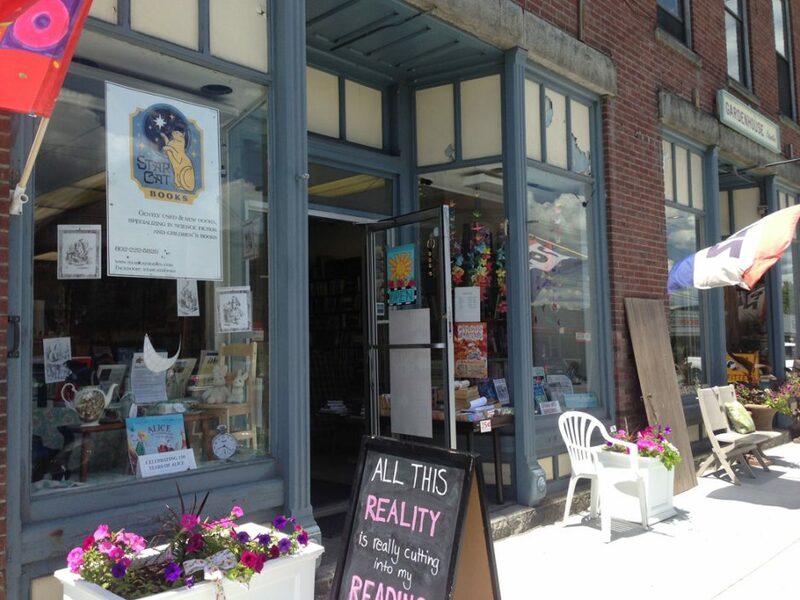 Or just drop by here in Bradford, VT! Condition: Good, hardcover, 1st ed., 1st printing. Ginn & Co., 1897, Boston, MA. Atheneum Press series, vol. 1 of 2. Lovely card included that had clearly been a schoolboy note used as a bookmark inviting his friend to his room to meet his mother and sister, and “Miss Barker,” noting the dormitory hall and room number. Another hall, owner’s name, also inscribed on first page of book. This is a lovely little edition in good condition with a tight spine, very clean pages, slight bumps on corners. Some wearing to boards on edges. Green boards with gilt lettering on cover; spine lettering clearly used to be gold but is now sun-faded. Incredibly good condition for its age and clearly had been read and used. No markings. Includes: Regularis Concordia Monachorum, Winchester Troper, St. John’s Dublin Easter dramatic office, fragments of vernacular liturgical plays, Norwich Whitsun Plays (Creation and Fall I & II), Townley Plays (Noah’s Flood), Hegge Plays (Noah & Lamech), Brome Play (Abraham & Issac), Townley Plays (Issac, Jacob), Chester Whitsun Plays (De Mose et Rege Balaak et Balaam Propheta), Hegge Plays (The Salutation & Conception), Townley Plays (The Second Shepherds’ Play), Coventry Plays (The Pageant of the Shearmen and Taylors), York Corpus Christi Plays (The Resurrection), Chester Whitsun Plays (Antichrist, Hengwrt version), York Corpus Christi Plays (The Judgement Day), Digby Plays (The Conversion of St. Paul), The Play of the Sacrament, Robin Hood Plays (Robin Hood and the Knight, Robin Hood and the Friar, Robin Hood and the Potter), St. George Plays (Oxfordshire Play, Lutterworth Christmas Play), The Revesby Sword Play, Mankind, Mundus et Infans, Hycke-scorner, Wytt and Science, Nice Wanton, The Foure PP, Kyne Johan. $15.00 plus shipping. Can take PayPal but will need to add in their percentages. Can take credit/debit by phone (802-222-5826 – store open Tues-Sat. 10am-7pm ET). Or just drop by our store in Bradford, VT!